The corrections profession is a tough business. While the work can be immensely rewarding, individuals entering this profession should be aware of both the tremendous opportunities that exist as well as the risks. Whether working in an institutional or community corrections environment, corrections professionals are faced with a myriad of challenges daily, from the populations we work with, responsibility to peers and leaders, queries from the media and public, and demands from friends and family. The successful correctional professional takes his or her work seriously, yet, outside of the workplace should have other aspects to their lives that are healthy outlets, providing balance to the demands of the work. Maintaining the safety and security of our staff, justice involved individuals, and the general public is paramount in this work. Also, within the corrections' mission is the responsibility to provide opportunities for justice involved men and women to reduce their risk to reoffend and ultimately to become productive community members. Managing those dual roles require a great deal of skill and commitment, often at the expense of personal well-being. As a profession, we invest signficant resources in offender safety, security and creating opportunities for rehabilitation and habilitation, but pay far less attention and resources to maintaining the health and wellness of correctional professionals. Correctional staff are the professions' most valuable resource. What steps will we take to hire the best, keep our staff well trained and prepared to carry out their responsibilities? How can we ensure they go home safely at the end of the shift, and return each day, motivated to perform at their very best for this important public safety work? Below you will find a list of topics and additional resources on health and wellness. Find a topic, click, and there will be a number of items of interest. Hot Topic: Do you have information about correctional officer work schedules? Hot Topic: What can we do after critical incidents to support staff? Hot Topic: Do you have information on officer safety and survival? When we think of incarceration, we think about people sentenced to prison. Perhaps we think of those in jail awaiting trial or serving a short sentence. When we think of reentry, the act of person’s returning home from prison, we think about sentenced people coming home. When we think about prison – we think of criminals. We rarely think about persons working in the prisons. In just four decades, the size of the U.S. state prison population grew by more than 700 percent. By 2008, the number of incarcerated individuals in the United States hit an all-time high, with 1 in 100 adults in either prison or jail and fully 1 in every 31 American adults under some form of correctional jurisdiction (including incarceration, probation, and parole). Researchers have noted these patterns and trends with alarm. Yet while expansive studies have been conducted on correctional systems in the United States, most of this work begins and ends with a focus on the incarcerated. Much of the early literature either ignores correctional personnel altogether, or paints an overly simplistic picture. While interest in those who work inside American prisons has begun to grow, we still know surprisingly little about what happens to correctional personnel as a function of spending a career inside the prison system. This two page handout provides statistics on corrections officer wellness and suggestions on what policymakers can do to address it. 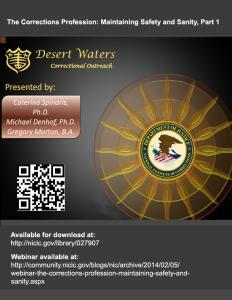 A publication of Desert Waters Correctional Outreach. Defines compassion fatigue, who it affects, sign & symptoms, contributing factors, what can be done, and how to develop a compassion fatigue prevention toolkit. Provides a list of rights for trauma survivors around personal boundaries, personal communication and personal dependency in therapy. Report on "the mental health of corrections officers, who, according to one study, have rates of post-traumatic stress disorder (PTSD) comparable to military combat veterans." Staff is the life blood of any agency and its most valuable resource. Their wellness is paramount to organizational health and mission effectiveness. What can individuals and organizations do to identify issues commonly associated with corrections stress and cultivate a climate of staff resilience and agency health, stability and excellence? During this broadcast, we will: Acknowledge the effects and consequences of corrections stress on staff and the organization; Identify commonly referenced terminology that informs the discussion of corrections stress; Explore the context and continuum of stress within the corrections profession; Discuss research and knowledge focusing on corrections stress that effects the individual and organizational culture; Present proactive strategies to identify and address cumulative effects and consequences of corrections stress; Describe individual and organizational strategies to build and maintain a healthy workforce; Discuss proactive tools and resources for both individuals and organizations; [and] Provide individual and organizational resources to promote and support a healthy workforce. This broadcast will answer the following questions: Why is corrections stress an issue we need to address? 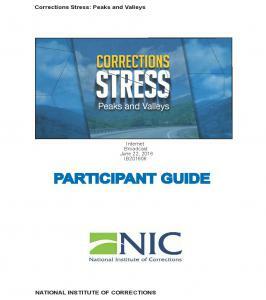 What are characteristics of corrections stress? What does it look and sound like? What are distinguishing features of corrections stress within institutional and community settings? How do you build awareness of this issue for yourself and your organization? 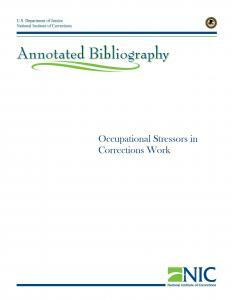 How do you address the problems and effects associated with corrections stress? What are strategies to deal with stressors? How can leadership introduce this issue within the agency? Who needs to be at the table to discuss it? What resources are available to you and your organization to address this issue? Are you taking advantage of them? What are tools and strategies for engaging and connecting directly with your community stakeholders? What positive steps can you take to make a difference personally and within your organization regarding corrections stress?" "Pubmed is an Internet search engine used to access millions of articles in biomedical and life science literature … only 23 articles are identified when searching “correctional officers (COs) and health.” This article is a snapshot of ongoing work and a growing national consortium of individuals interested in advancing the well-being of Cos" (p. 1). Sections cover : hazards of corrections work; stress is hazardous to your heart; ways to improve well-being; first National Symposium on Corrections Worker Health; and conclusion. "The review of CO stressors concluded that, while there are local efforts and recommended best practices, there are no proven effective safety and health programs for COs, and more studies are needed" (p. 4). This three part series addresses the issue of corrections fatigue and how corrections staff can deal with it by developing "hazmat suits for their souls". A hazmat suit for the soul allows you to respond to the "hazardous materials" of daily stress and dangerous incidents during work and to "decontaminate" emotionally afterwards. Part One explains "complex trauma", how it can result in psychological symptoms, diagnostic psychiatric disorders like post-traumatic stress disorder (PTSD), adverse workplace performance, costs, and neurobiological changes. Part Two compares "negative resilience" and true resilience. It explains the need for corrections staff to seek "solid and enduring resilience is of primary importance, as literally lives may depend on it". Part Three explains how corrections staff can develop effective hazmat suits for the soul using prevention or intervention approaches. This part also describes four "categories of behavior (aka factors)" that can increase resilience in corrections staff. The factors are supportive staff relationship effects; self-care health maintenance efforts; confident/perseverant frame of mind; and controlled/logical problem-solving. NOTE: This set of articles was previously published in 2011, and have been updated and reprinted. This is an excellent introduction to compassion fatigue (CF) (aka corrections fatigue) experienced by correctional health care staff. "While there is some literature on CF and burnout among correctional officers, there is scant information on how these phenomena affect correctional health care staff. This article discusses ways that CF may adversely impact the well-being of qualified mental health professionals who work in jail and prison settings. When left untreated, CF may result in serious and detrimental personal costs to the individual and organization. These costs can be mitigated by positive self-care, which also will be addressed in this article" (p. 10). Sections of this article cover: what compassion fatigue is; the role of trauma; why we neglect ourselves; the importance of prevention; compassion satisfaction—the flip side of CF; calendar it—planning ahead for self-care; organizational considerations; and taking care of yourself. "This bibliography attempts to offer a compilation of information on trauma-informed care by reviewing general information about trauma as well as focusing on the criminal justice system and corrections (women, adults, and younger people), peer support, and screening/assessment for trauma. In addition, definitions of many of these tools are provided" (p. 3). Eighty-four resources are organized into the following areas: trauma-informed care in general; trauma-informed care in the criminal justice system and in corrections; trauma-informed care for youth in the criminal justice system; peer-to-peer trauma-informed care; trauma; gender neutral screenings and assessments; and trauma and/or gender informed screenings and assessments. "The primary goal of corrections work is the safe and secure management and rehabilitation of justice-involved individuals, whether in locked facilities or within community supervision programs. Pursuit of this goal comes with demanding requirements such as the necessity of staff to maintain constant heightened vigilance while they work and also adhere to strict security protocols. In addition, corrections staff must perform their duties within harsh physical environments and with repeated exposure to violence, injury, and death events. Data supports a health and functioning toll of corrections work that must be not only endured but overcome if corrections staff are to perform optimally over time and if staff are to develop a sense of job-related success, pride, meaning, and professional fulfillment. Meeting and overcoming the occupation-specific challenges of corrections work will, by necessity, require an accurate and specific understanding of the converging forces impinging on staff’s health and functioning, how these manifest, and how they can be deterred. This paper presents an evidence-supported model and framework for the comprehensive understanding of occupational threats to corrections workplace health and functioning as well as a data-driven and evidence-based strategy for addressing them" (p. 1). Sections of this paper include: types of stressors in corrections environments; direct and indirect traumatic exposure; use of varying terminology in the literature regarding traumatic exposure; types of corrections fatigue components; interacting components; a six-stage model for addressing corrections fatigue; and summary. Sections of these proceedings are: about this meeting; meeting highlights; "I.L.P. : Intelligence-Led Policing in a Detention Environment" by Ed Beckman; "Segregation of High Risk Medical and Mentally Ill Inmates": "Part 1. Segregation of High Risk Medical and Mentally Ill Inmates" by Herbert L. Bensen", and "Part 2. Successful Practices in Preventing Inmate Suicide" by Jack Herron; "Staff Misconduct" by Wendell France; "Crisis Intervention Teams" by Shayne Grannum; "Counterfeiting and Jails: The National IPR Coordination Center" by Tony Ruocco; "Staff Wellness: Managing/Implementing Organizational Change": "Part 1. Organizational Culture, Change, & Connection: Resistance to Change" by Michael W. Frost", "Part 2. Corrections Fatigue" by Grannum, and "Part 3. Staff Wellness: What Is Our Responsibility as Administrators?" by Elias Diggins; Open Forum; professional association updates; and future meeting topics. An appendix provides "Index of Past LJN Meeting Topics". This article summarizes the findings of a recent study, "Prison Employment and Post-Traumatic Stress Disorder: Risk and Protective Factors". The study concludes that "Correctional employees experience some of the highest rates of mental illness, sleep disorders and physical health issues of all U.S. workers." The following is the conclusion of a three part series. Colorado is not alone in their treatment of mentally ill individuals. The sad fact of the matter is that the biggest mental health facilities in this country are jails (Slate, 2008). When this country deinstitutionalized the mental health system in the late 50’s and then failed to adequately fund community systems, large numbers of mentally ill people ended up in prison. This was a foreseeable outcome of the political actions taken with regard to mental health care. The only surprising thing about this chain of events is that some have the nerve to act surprised by the outcome. The following is Part 2 in a three part series. As the Colorado system continued to grow, designs were completed for many additional facilities, including yet another supermax facility: CSP II. The CSP II facility was designed to be a replication of the first CSP; however, the funding plan for this prison was non-traditional. This second supermax was expected to be funded through a lease purchase agreement and this new type of funding was challenged in the courts. It took three years for the court system to decide that the funding plan was legal and by then (2007) the cost of construction had increased so that modifications had to be made to the design of CSP II These modifications removed all programming areas and added the latest technology in the inmate cells. This technology allowed for communication with employees through a computer monitor and allowed for video visitation with friends and family. With the new technology, the number of reasons that an inmate would need to be removed from his cell was cut by half. 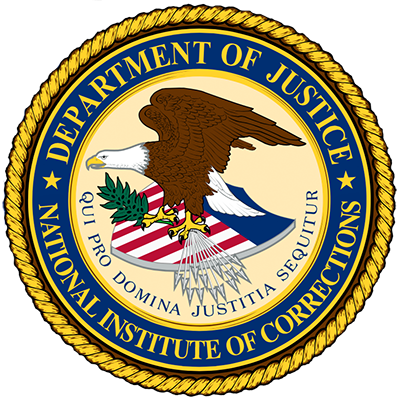 The computer system dramatically increased the safety of all involved, but it also decreased the amount of human contact the inmate had during his incarceration at CSP II. The changes in the design even removed the speaker ports on individual cell doors so that all communication had to come through the speaker system of the computer system. The evolution of supermax was taken to a whole new level. Distributive justice and procedural justice, two dimensions of organizational justice, have been found to be important workplace variables in shaping correctional staff job stress, job satisfaction, and organizational commitment. It is unclear, however, whether distributive justice and procedural justice are associated with correctional staff life satisfaction. Multivariate analysis of survey data from correctional staff at a state prison found that staff perceptions of both distributive justice and procedural justice had significant positive relationships with a measure of life satisfaction. Although correctional staff job burnout is costly to all involved, it has not received the empirical attention it deserves. The job characteristics model holds that job characteristics are important in shaping employee outcomes. This study focused on the effects of the job characteristics of supervision consideration, supervision structure, job autonomy, and job variety on the three dimensions of job burnout (i.e., emotional exhaustion, depersonalization, and perceived ineffectiveness at work) among correctional staff. Ordinary least squares (OLS) regression analysis of data from 160 staff members at a private prison indicated that job autonomy and job variety had significant negative relationships with emotional exhaustion. Supervision consideration, job autonomy, and job variety all had negative effects on the depersonalization dimension of burnout. Job autonomy and job variety had significant negative effects on perceived ineffectiveness. This Oregon DOC study " examined the mediating process of perceived stress on the relationship between perceived dangerousness of the job and the negative employee well-being outcomes of work-family conflict and symptoms of psychological distress, as well as the moderating effects of family supportive supervisor behaviors on this process. As part of a larger study, survey data were collected from 1,370 state correctional officers." Corrections and Mental Health article. This NIC National Jail Exchange article presents information about the causes and pervasiveness of workplace stress experienced by jail staff. Prison conditions have been at the center of long-standing debates among corrections scholars. Interestingly, this debate has focused on inmates alone while paying little attention to the potential impact of prison conditions on staff. Addressing this limitation, the study draws on survey data collected from a stratified random sample of prison staff working at all federal prisons in 2007 to examine the impact of prison conditions on staff well-being (substance use, psychological symptomatology, physical duress, and sick leave use). Mixed-level models show that harsh physical conditions correspond to significant problems for staff on all outcomes measured (individual-level impacts). The data also show that prison-level aggregations of harsher conditions correspond to significant deterioration in staff physical and psychological symptomatology above and beyond individual-level effects. The purpose of this study was to assess traumatic stress and burnout in probation officers who work with criminal offenders. Adult probation officers from five departments in three states (Arizona, California, and Texas) participated in this study. (Kirsten Lewis, author). Correctional staff job burnout is costly to all involved. As such, it has generated a growing body of research. This study reviewed 53 empirical studies of correctional staff burnout and two review articles published between 1981 and 2014. The majority of studies focused on staff working in a variety of institutional positions, fewer studies focused exclusively on the subgroup of correctional officers, and even fewer focused on a different subgroup. The majority of studies also involved staff at US government-run adult prisons. Most but not all studies utilized Maslach’s Burnout Inventory. Based on this narrative review, significant gaps remain in the research on correctional staff burnout. This Corrections.com article discusses our physical response to stress. The Autonomic Nervous System (ANS), which involves voluntary behavior, activity is explained as it relates to handling stressful events and responding to relaxation techniques. "Reading has a pro-social effect on the reader because the author creates characters to act and react within a social context. When an inmate identifies with a character, he experiences decisions and choices made in a social context and anticipates the consequences for the character. One aspect of criminal thinking is that they often do not sense consequences for their actions because they do not recognize their own social context. This is one reason why I am passionate about promoting reading among inmates. The other reason is to provide an invitation to pro-social bonding with the library." Australian study - The overall aim of this study was to develop and evaluate a resilience training program designed specifically to help new-recruit police officers mitigate stress reactions and the use of drugs and alcohol. In the spring of 2013 the Oregon Department of Corrections (henceforth referred to as the 'department') began a collaboration with the Prison Mindfulness Institute to explore the efficacy of mindfulness/ meditation practice to promote wellness and resiliency of staff working in the department?s prisons. The goal of this project was to learn more about how introducing staff to basic mindfulness/ meditation skills might impact staff climate/culture and individual staff?s self-awareness and emotional resiliency. "Seven staff fatalities including three suicides in just three years (2010-2012). For professionals who operate correction facilities, stress can be a significant issue with fatal consequences. The Middlesex Sheriff’s Office (MSO) had 45 staff fatalities over the past 30 years. Twenty-four percent of these deaths were suicide. MSO believes the other deaths are tied to stress and wellness related health issues such as heart attack, stroke, diabetes and high blood pressure. MSO Sheriff Peter Koutoujian assumed the leadership role at this time and focused on improving correctional officer (CO) wellness and safety … MSO approached the Office of Justice Programs Diagnostic Center for assistance understanding the contributors to CO work-related stressors. MSO’s goal was to identify and alleviate the causes of workplace stress to improve CO wellness and safety and reduce CO suicide through implementation of evidence-based programs and promising practices" (p. 1). This document describes the Center's analysis and recommendations. Sections of this case study include: overview; data-driven programs and practices recommended to address the issue; the Diagnostic Center; the diagnostic process; six factors contributing to the issue; descriptions and details of the recommended evidence-based programs and practices; Diagnostic Center's recommendations; impact and outcome; community's response; and insight gained. This program is the second of a two-part webinar, and covers the physical and emotional challenges faced by correctional personnel. “The dangers correctional staff encounter on the job are well known to their leaders. A lesser known but possibly more hazardous set of factors involves the cumulative negative side effects of what staff experience through daily interactions with justice-involved individuals and immersion in uniquely challenging workplace conditions. Such side effects can be understood as examples of “Corrections Fatigue.” The webinar will describe a process model developed and modified over several years by DWCO [Desert Waters Correctional Outreach], entitled “From Corrections Fatigue to Fulfillment™.” Once Corrections Fatigue manifests, it can promote toxic adaptations to work demands, consequently undermining job performance, employee morale, health, personal and professional relationships, and employee retention.” Objectives of this webinar are: describe the concept of Corrections Fulfillment; present the basics of a data-driven, evidence-based approach to addressing Corrections Fatigue; and present corrections-specific resources to address Corrections Fatigue and promote Corrections Fulfillment. This program is the first of a two-part webinar, and covers the physical and emotional challenges faced by correctional personnel. “The dangers correctional staff encounter on the job are well known to their leaders. A lesser known but possibly more hazardous set of factors involves the cumulative negative side effects of what staff experience through daily interactions with justice-involved individuals and immersion in uniquely challenging workplace conditions. Such side effects can be understood as examples of “Corrections Fatigue.” The webinar will describe a process model developed and modified over several years by DWCO [Desert Waters Correctional Outreach], entitled “From Corrections Fatigue to Fulfillment™.” Once Corrections Fatigue manifests, it can promote toxic adaptations to work demands, consequently undermining job performance, employee morale, health, personal and professional relationships, and employee retention.” Objectives of this webinar are: describe types of occupational stress that may negatively impact the well-being of corrections staff; present the “umbrella” term of Corrections Fatigue, its nature, properties and consequences; and present research evidence that supports a model of Corrections Fatigue and its usefulness in providing interventions regarding increasing staff well-being. This download includes copies of the video, transcript, and presentation slides. Issues surrounding stress in a correctional setting, like the effects, sources, and symptoms of stress, burnout, and coping strategies, are covered during this 6.5 hour course. Participants will be able to: define stress and identify the effects of stress; identify the sources of stress; identify the physical and behavioral symptoms of stress; define burnout and identify the stages of burnout; identify positive and negative coping strategies; summarize the key components of “My Pyramid”; recognize how thoughts, feelings, and attitudes lead to predictable patterns of behavior; practice “objective detachment” in observing and describing thoughts, feelings, and attitudes; and practice identifying stress-mitigating responses to work-related situations. Also included is the PowerPoint presentation, video vignettes, and participant handouts.